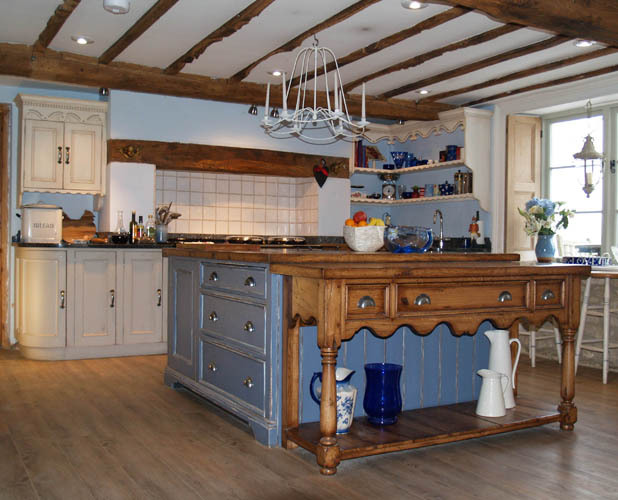 A beautiful farmhouse kitchen in the French style. 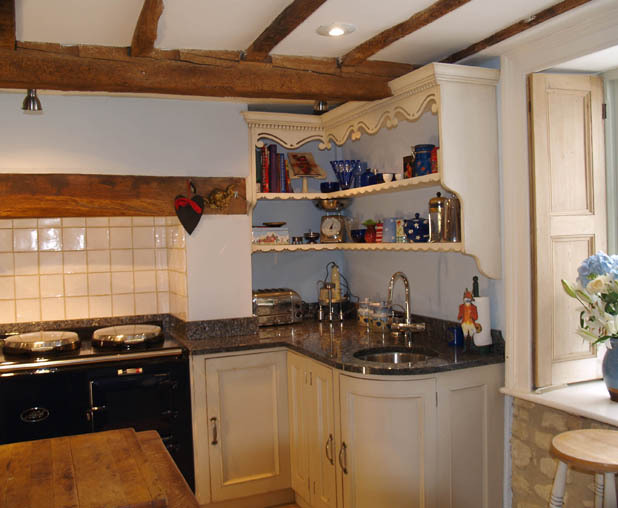 The newly formed faux chimney-breast gives a focal point to kitchen. 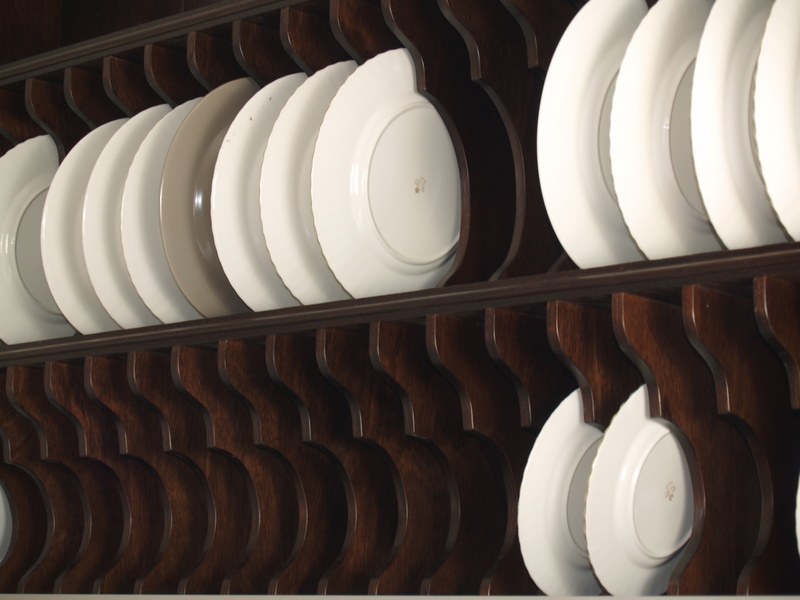 The delicate wall racks include an authentic "dentilled" cornice and fine, hand turned finials. 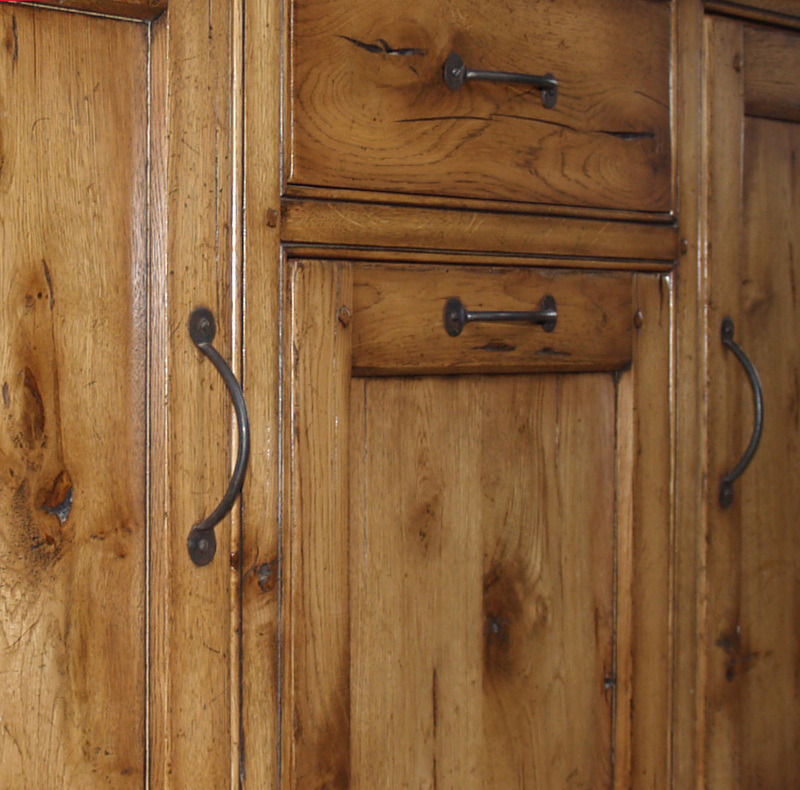 The warmth and character of our "signature" Oak finish. 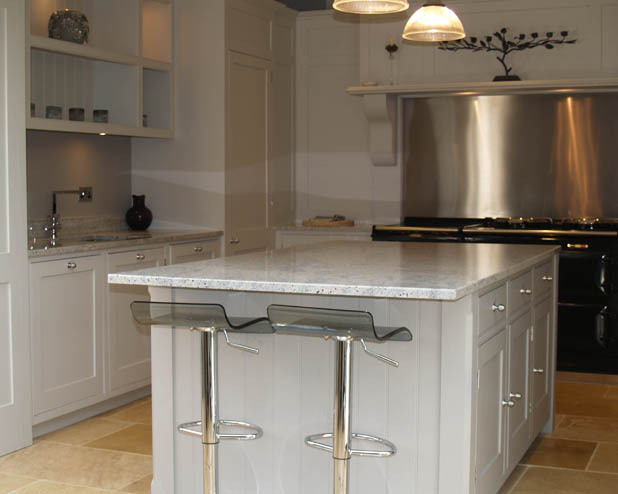 Our work often incorporates the functionality of modern kitchens. 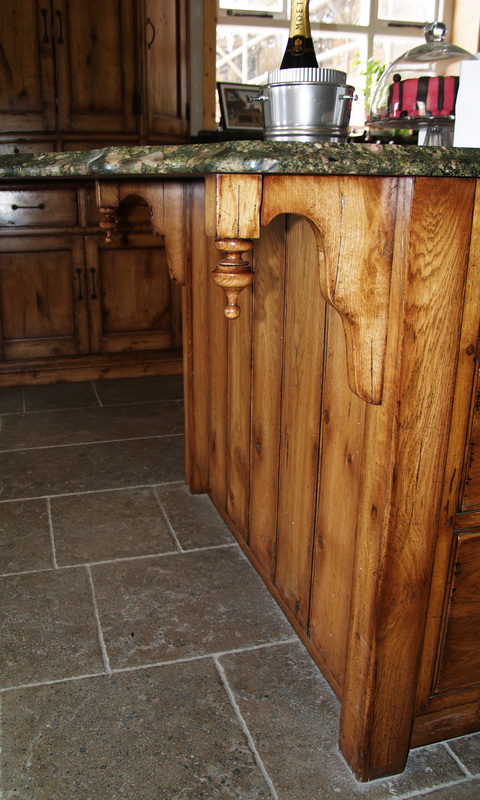 All of the leading corners are angled back to "soften" movement around the kitchen. 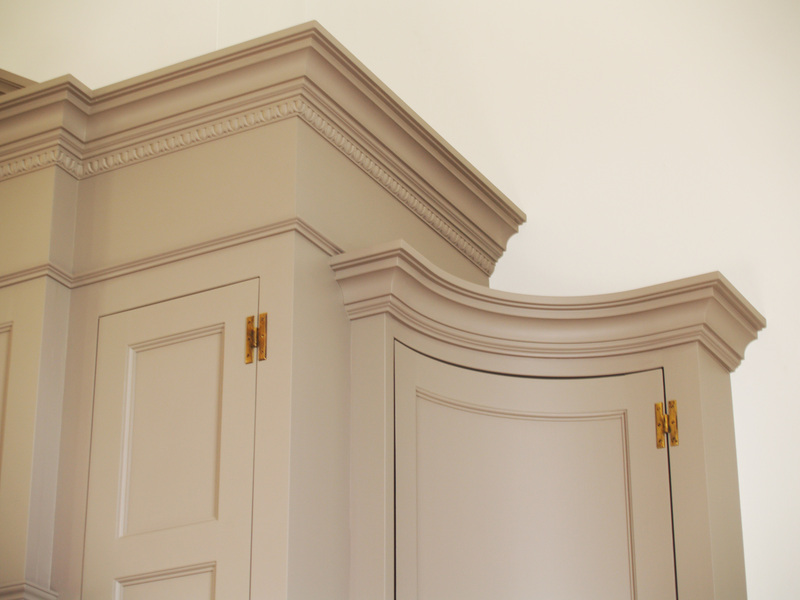 The hand cut reeded pilaster detail is taken from an original 18th Century design. 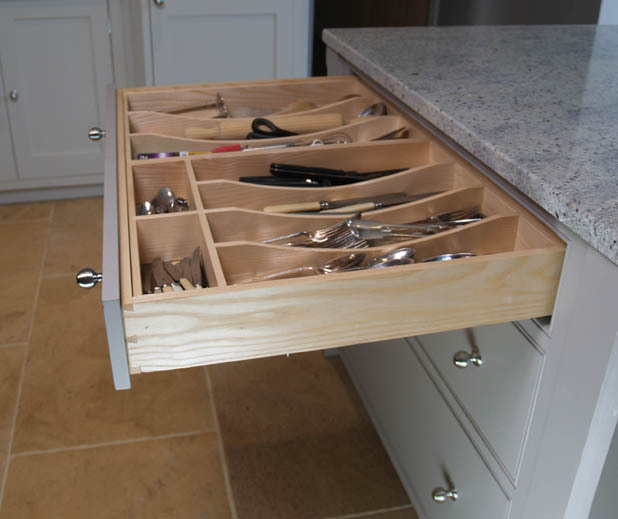 Full extension of a cutlery drawer. 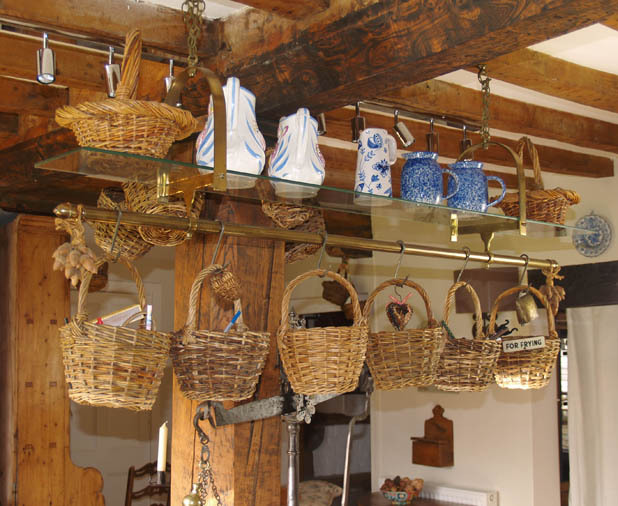 A simple hanging rack and baskets were the clients own idea and a fantastic addition. 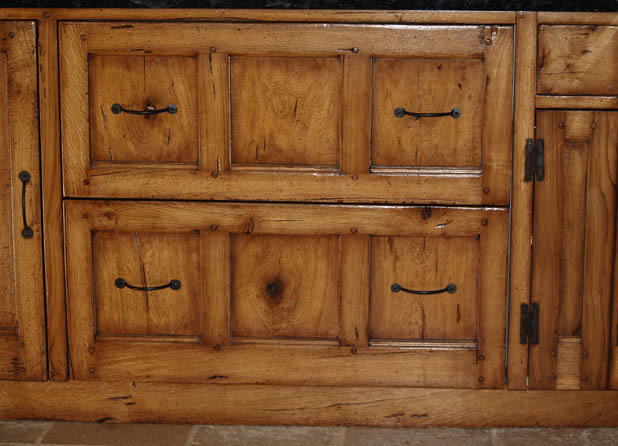 A combination of Oak and distressed painted finishes. 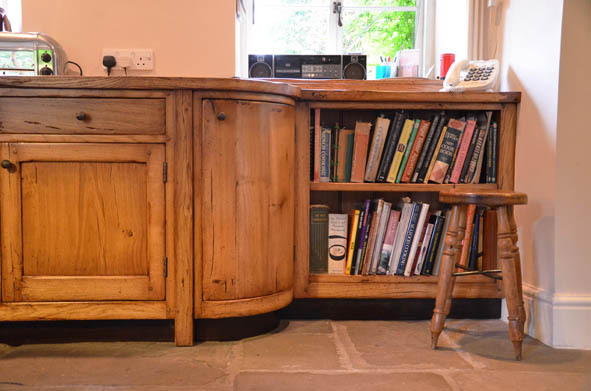 The Oak side-table can be moved anywhere in the kitchen. 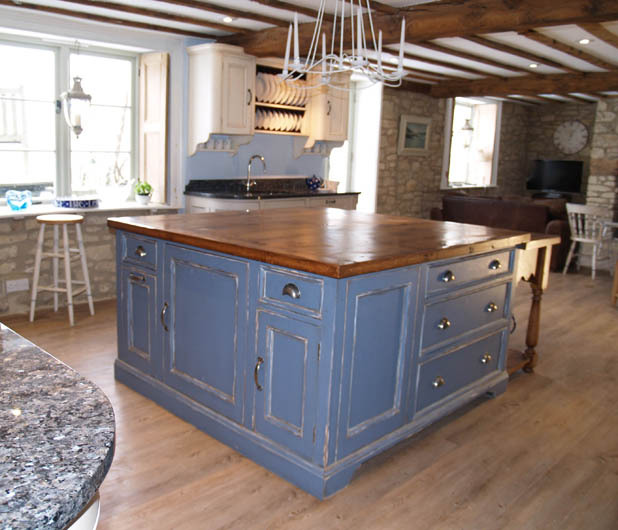 The blue paintwork to the island has been heavily distressed to look authentic and aged. 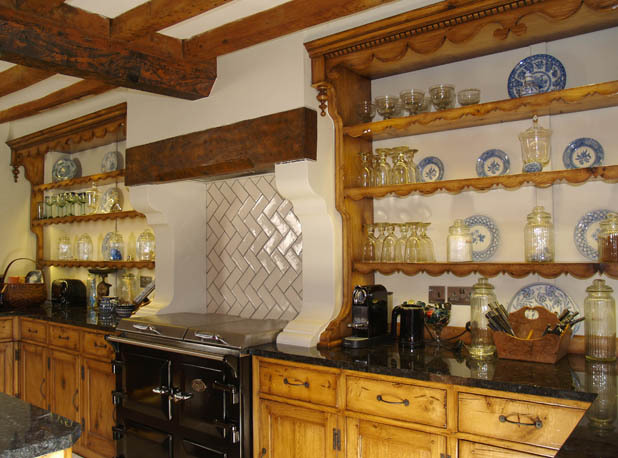 Fine "piercing" to the frieze of the elegant wall rack was taken from an original 17th Century design to reflect the age of the property. 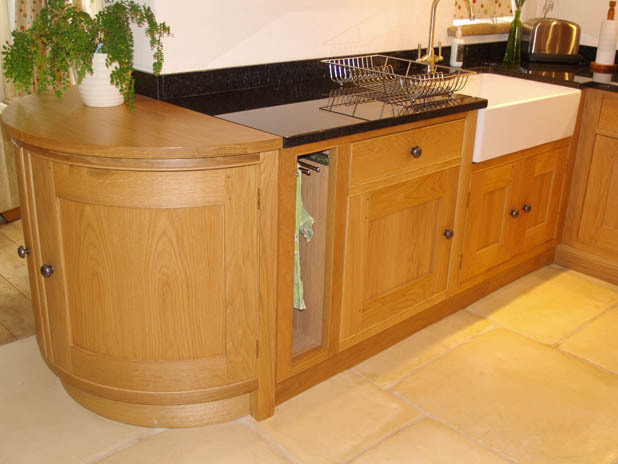 Curved ends offer softer movement around the kitchen. 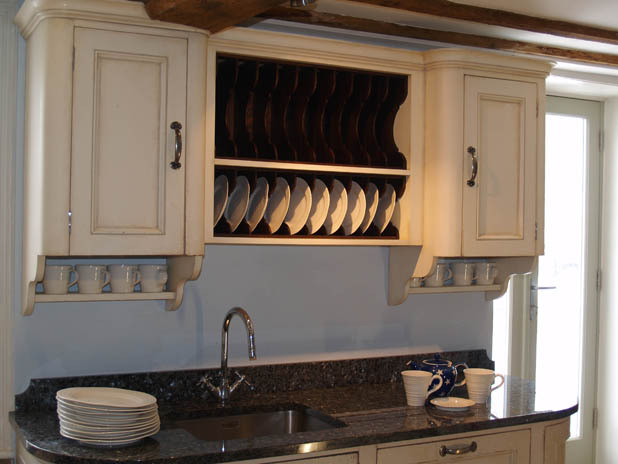 This shaped plate rack in a dark Oak works wonderfully with the antiqued paint finish. 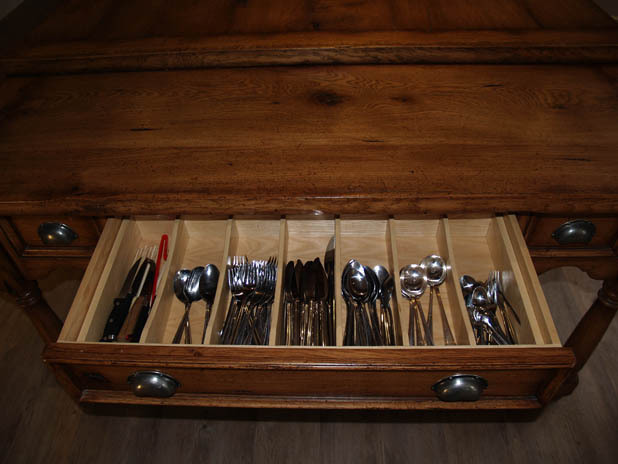 A full extension of the cutlery drawer from the Oak side-table. 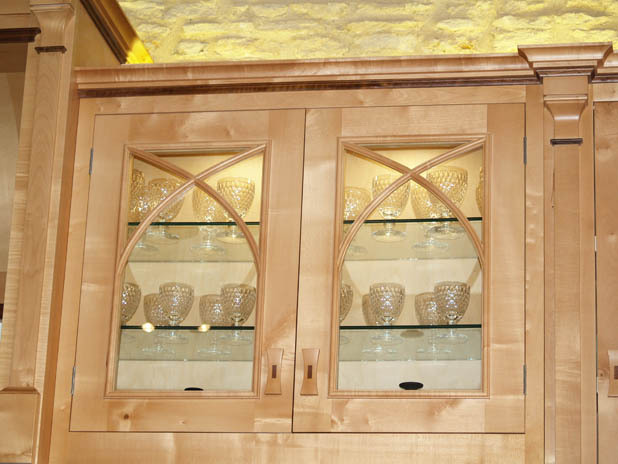 Here the Oak exudes warmth and character from the "barrel" form of curved doors. 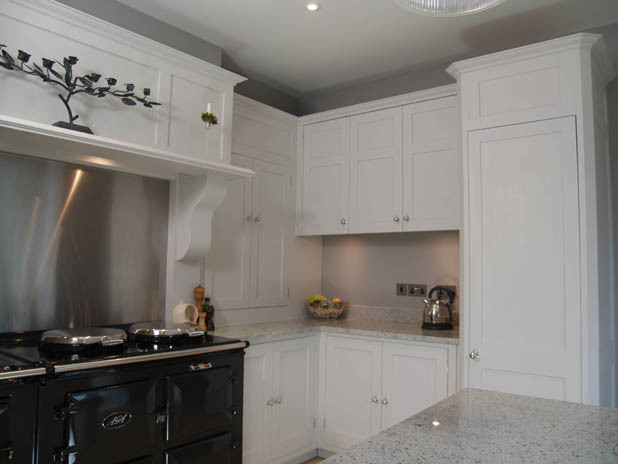 An attential to detail is evident in every project we undertake. 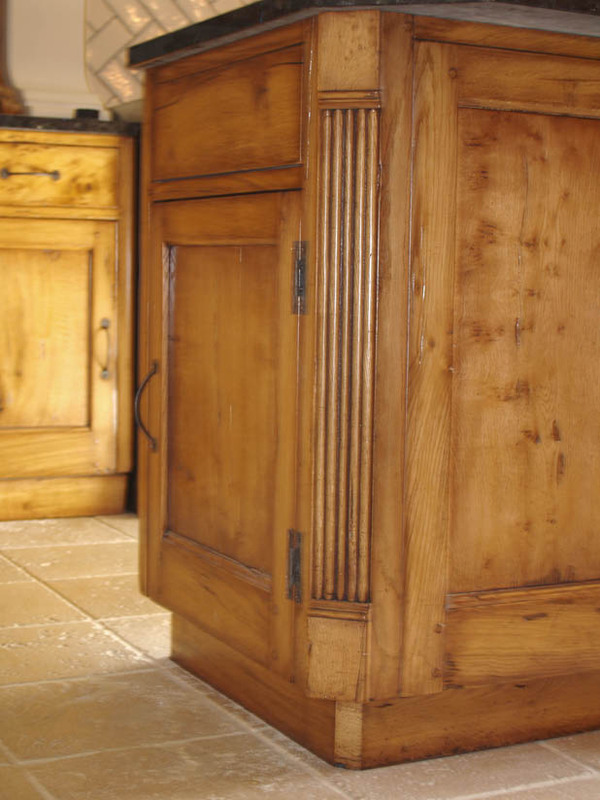 Here, from the stool, to the units, shelves and doors, you can see every piece is treated with the same meticulous care. 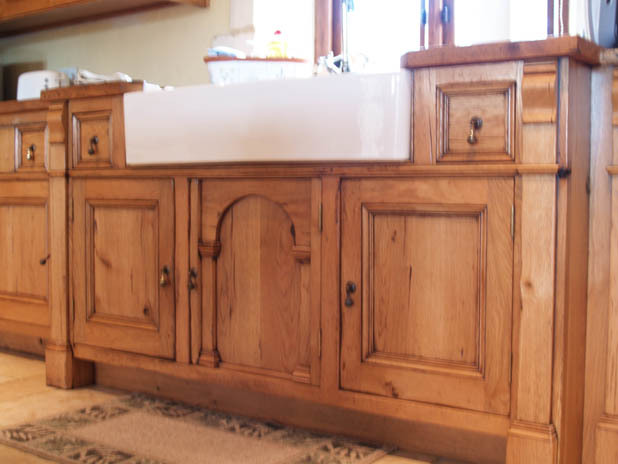 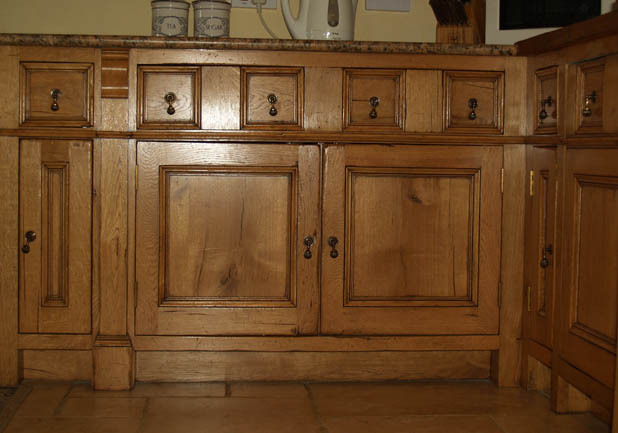 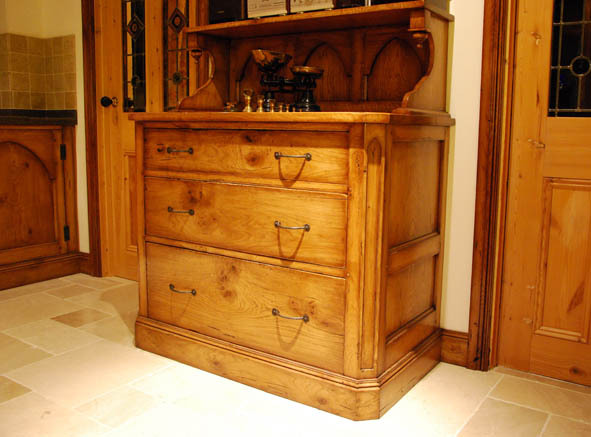 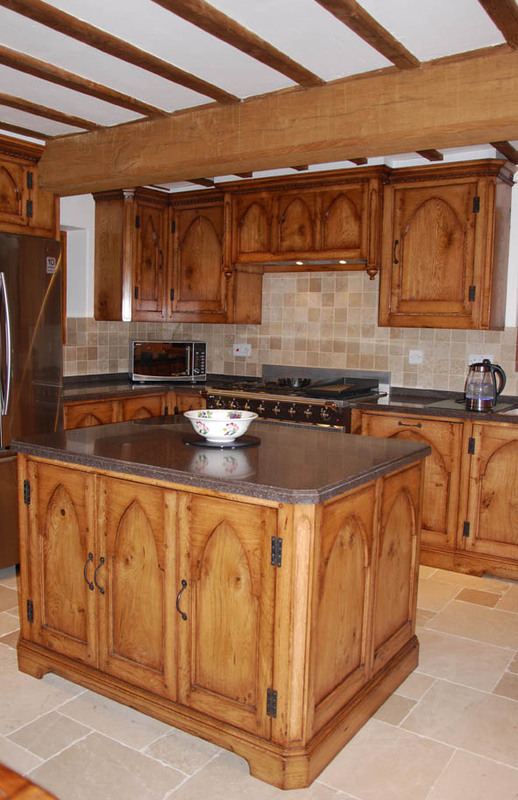 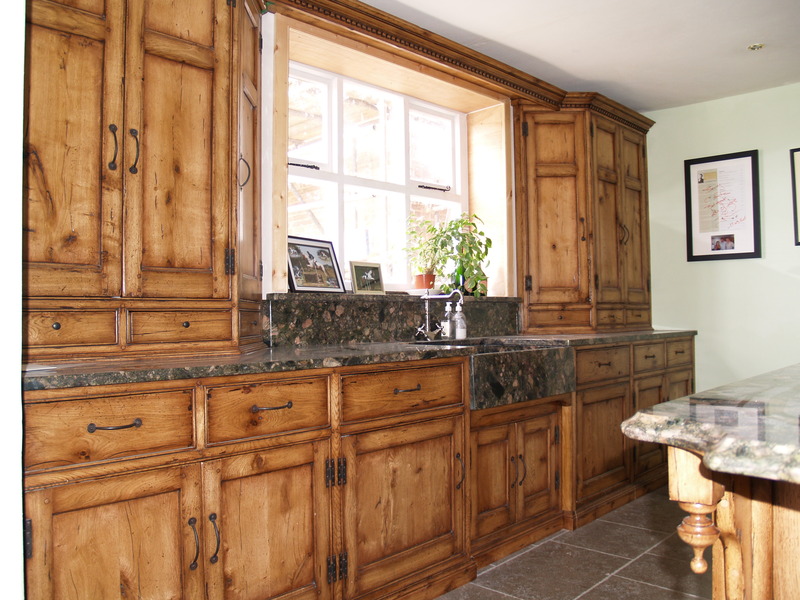 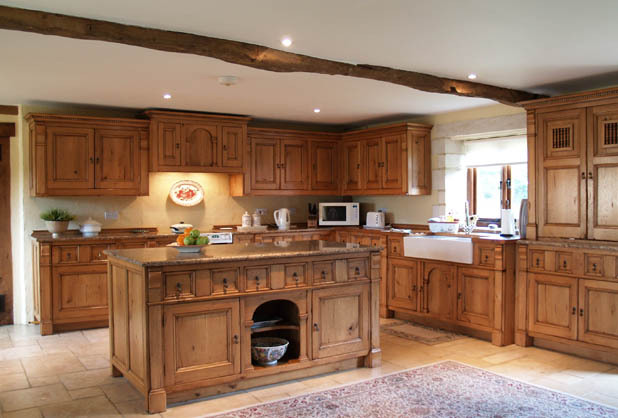 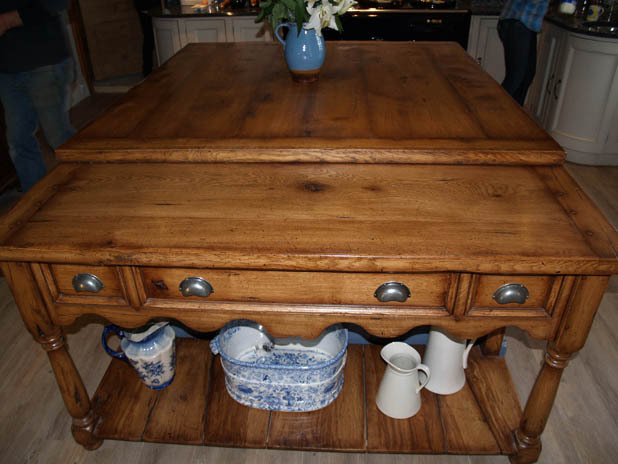 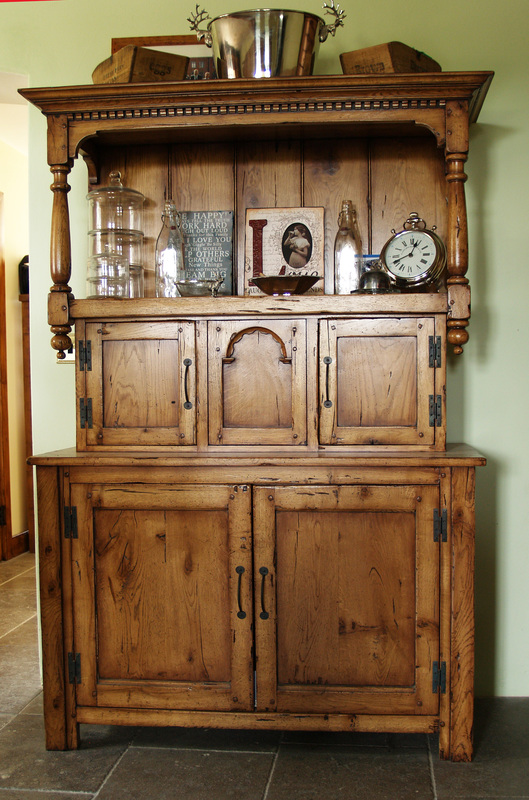 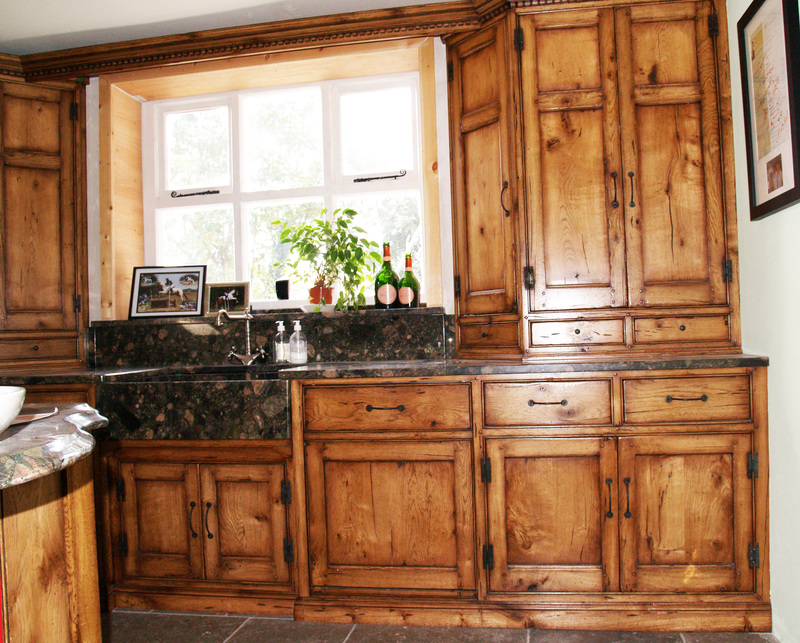 Our "signature" Oak finish compliments country kitchens beautifully. 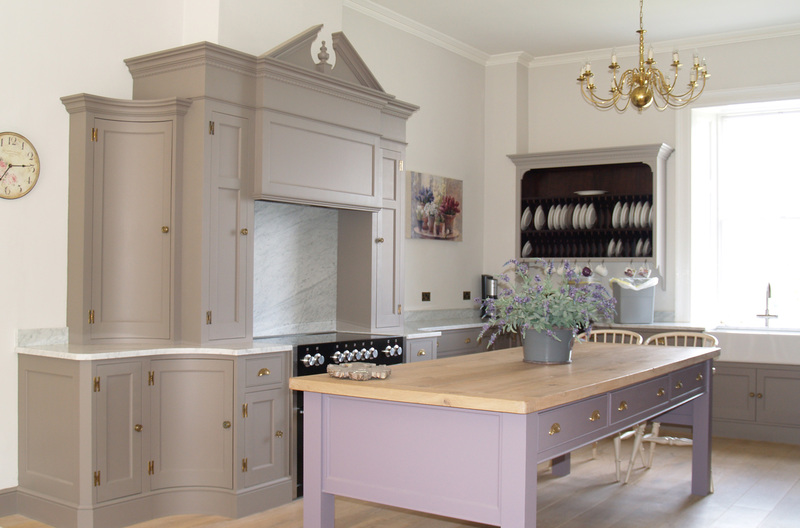 Painted wall racks can add a splash of colour to kitchens. 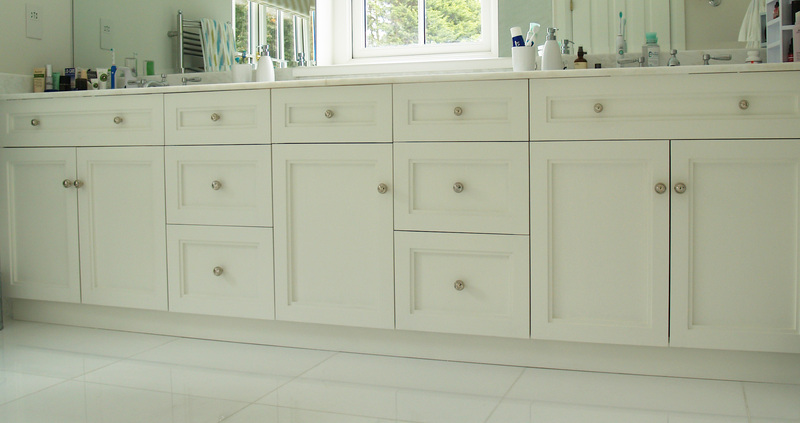 Here a cream colour creates a light and airy atmosphere. 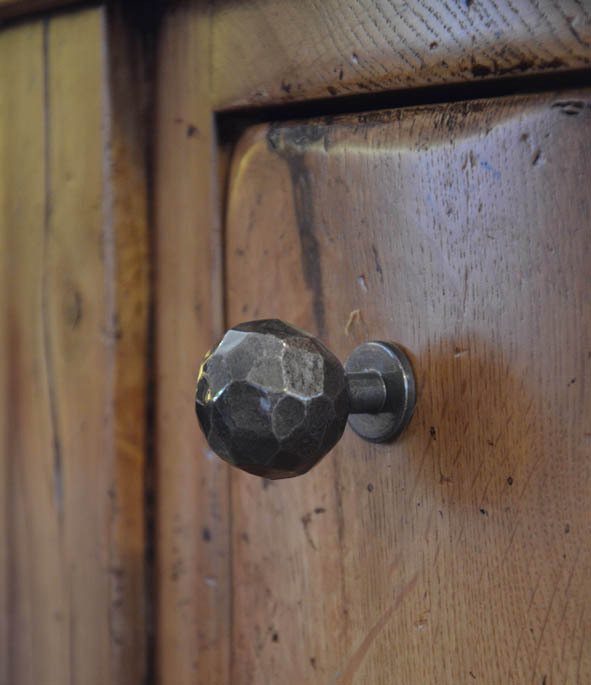 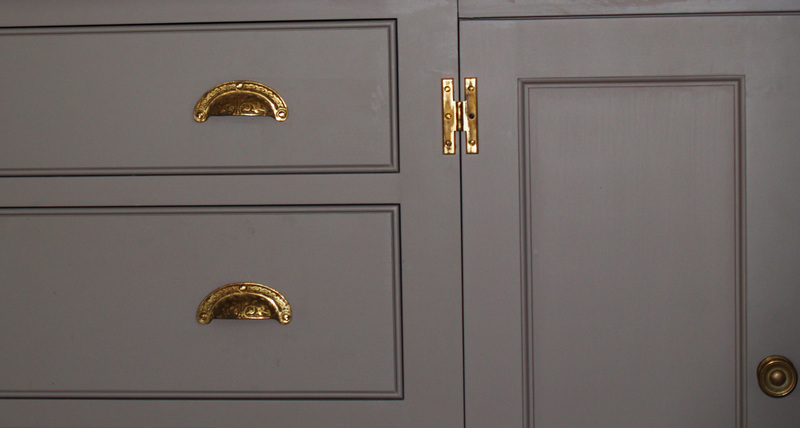 Carefully selected "gun-metal" knobs always work well against Oak. 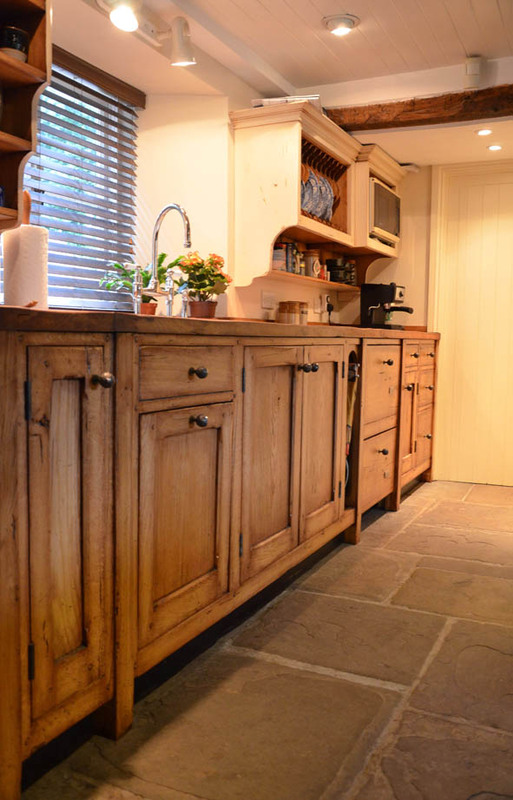 A hand painted kitchen in a traditional, rustic style. 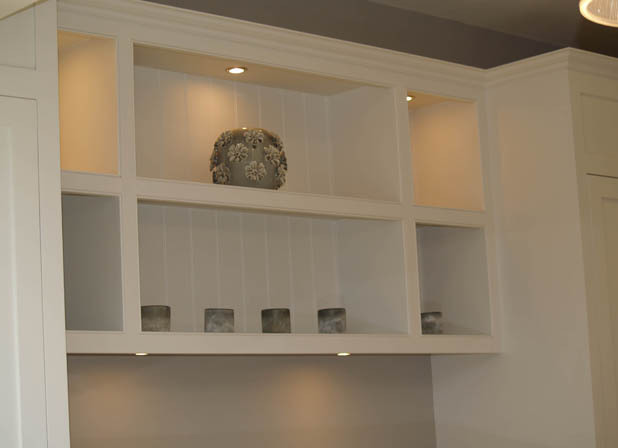 The elegant simplicity of this design maintains offers a traditional look in a contemporary space. 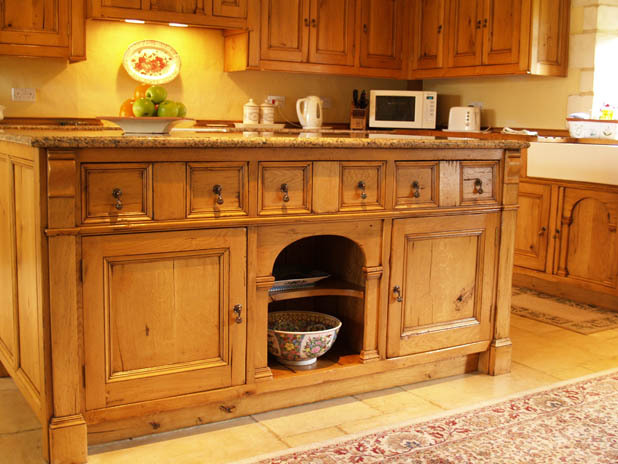 Large island units can offer plenty of additional storage solutions. 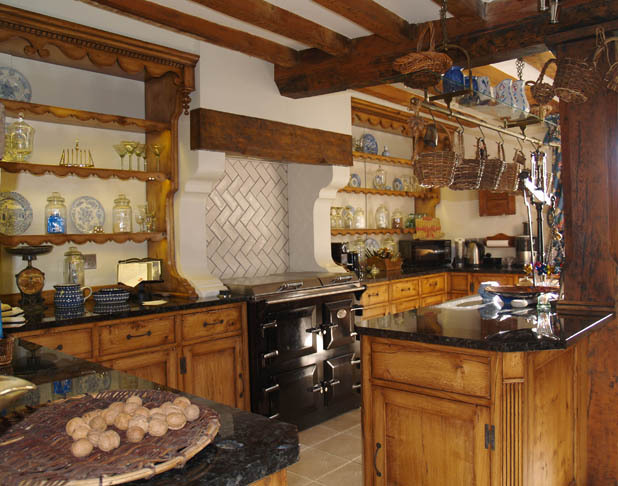 A fusion of contemporary and traditional designs. 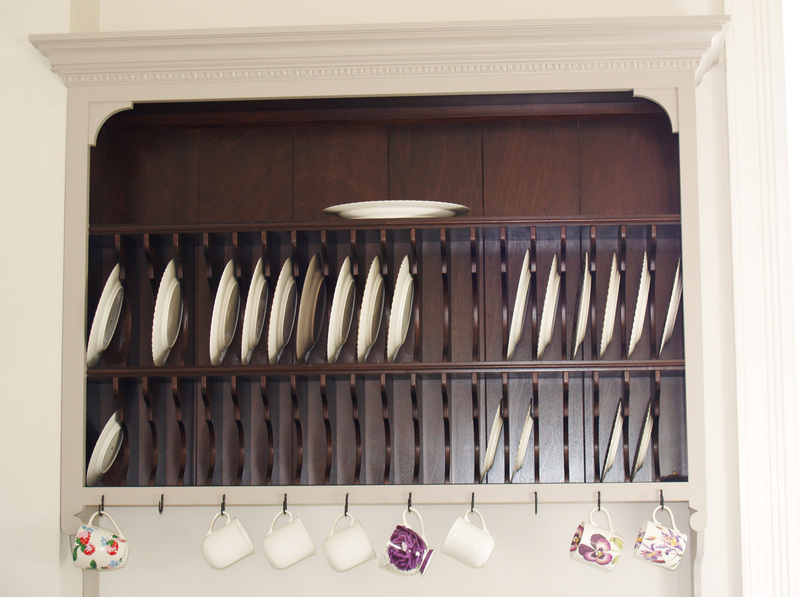 An extension of a stunning and practical cutlery draw. 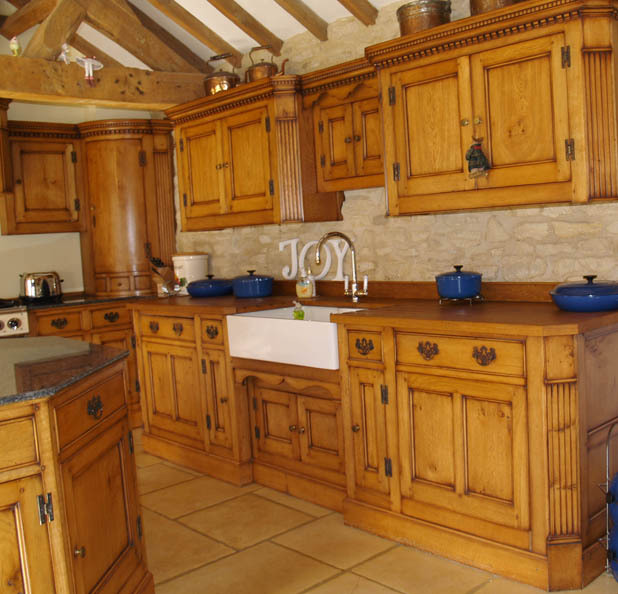 A beautiful kitchen from native Sycamore. 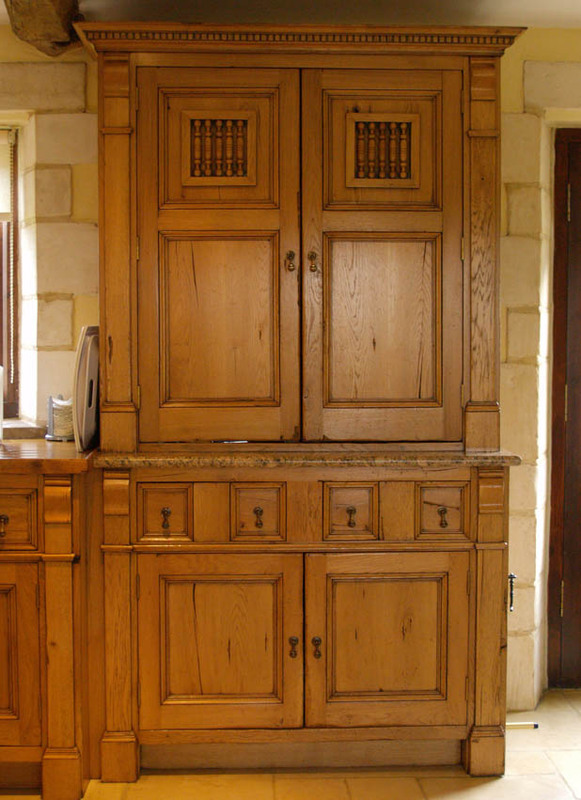 The contrasting Walnut creates the ‘Biedermier’ styling. 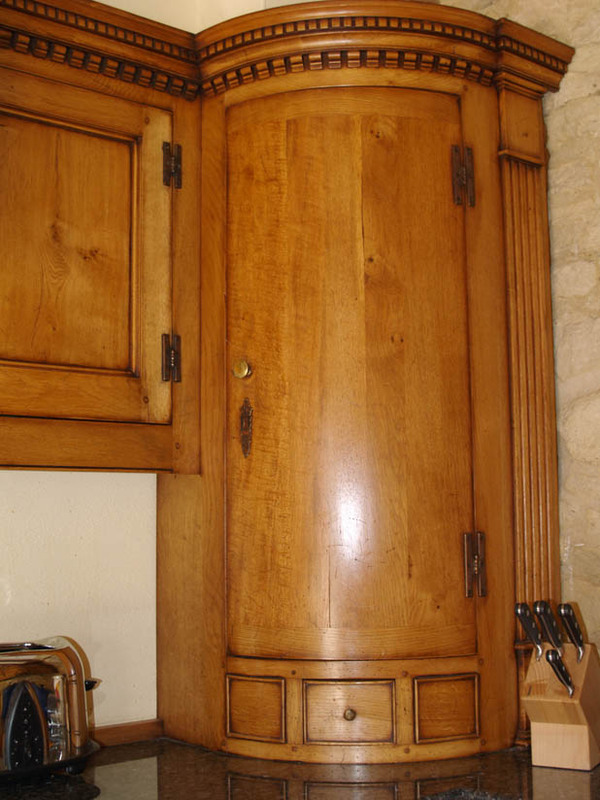 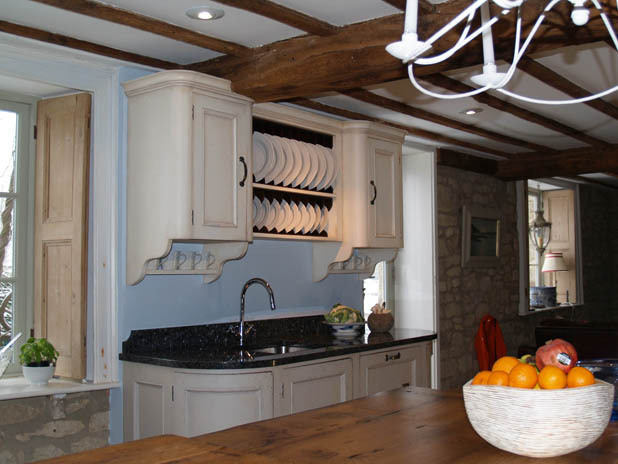 Superb wall cupboards with traditional glazed bars. 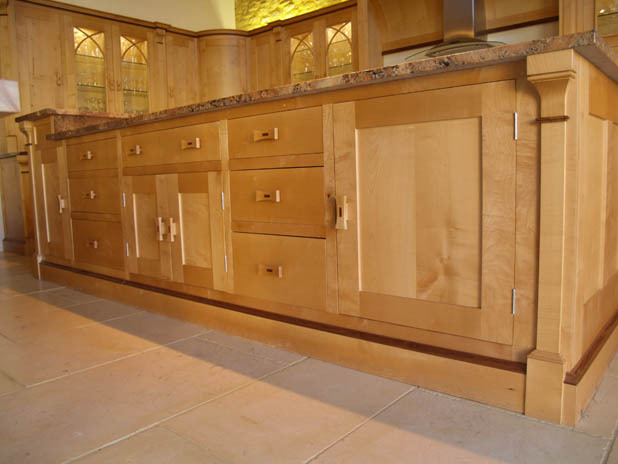 The inlaid Walnut bow handles were all made by hand at our workshops. 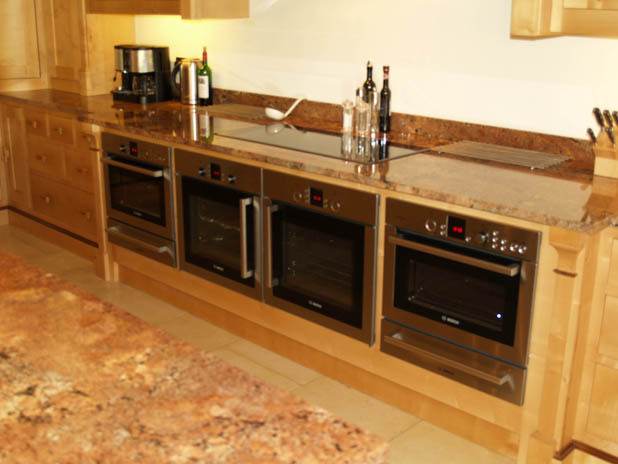 A capacious island unit offering plenty of storage space. 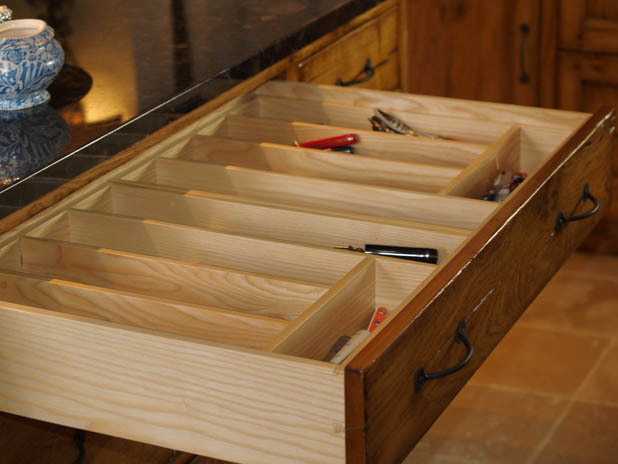 Graduated drawers offer a great storage option. 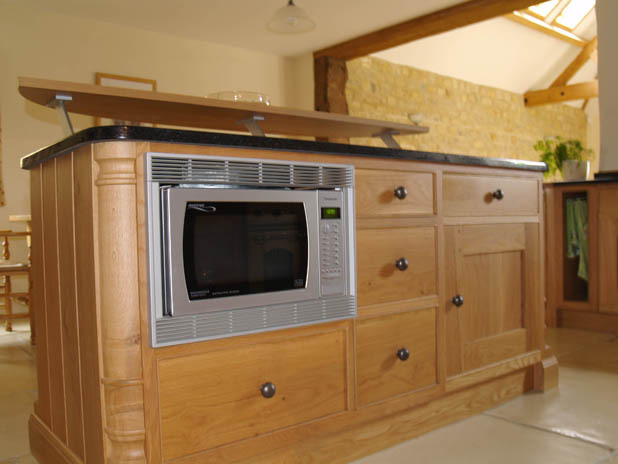 This unusual layout offers unique cooking options. 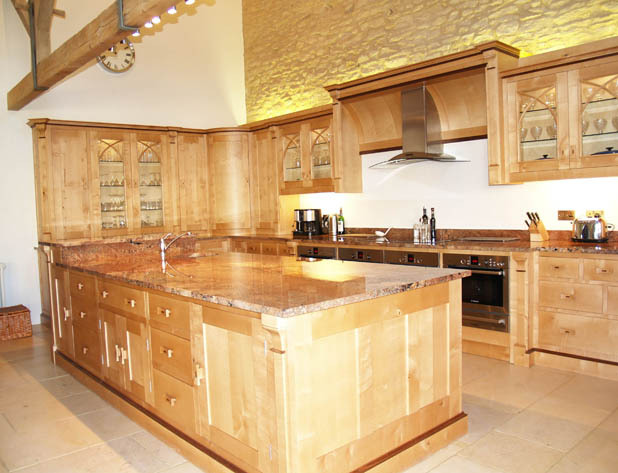 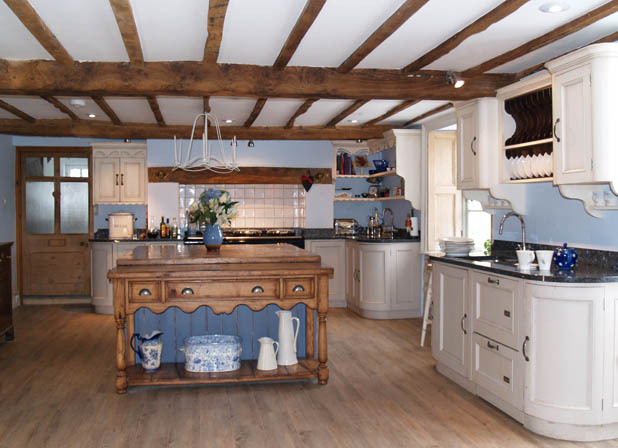 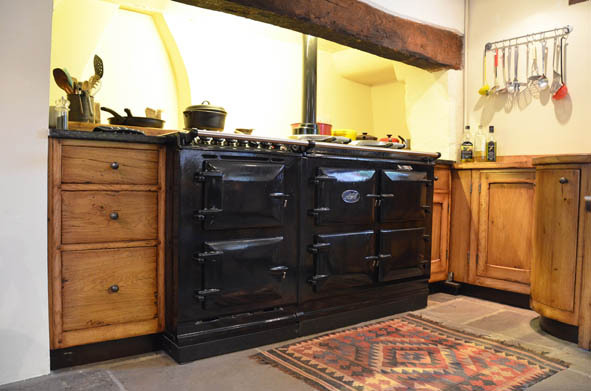 A Gothic style kitchen in a beautiful barn conversion. 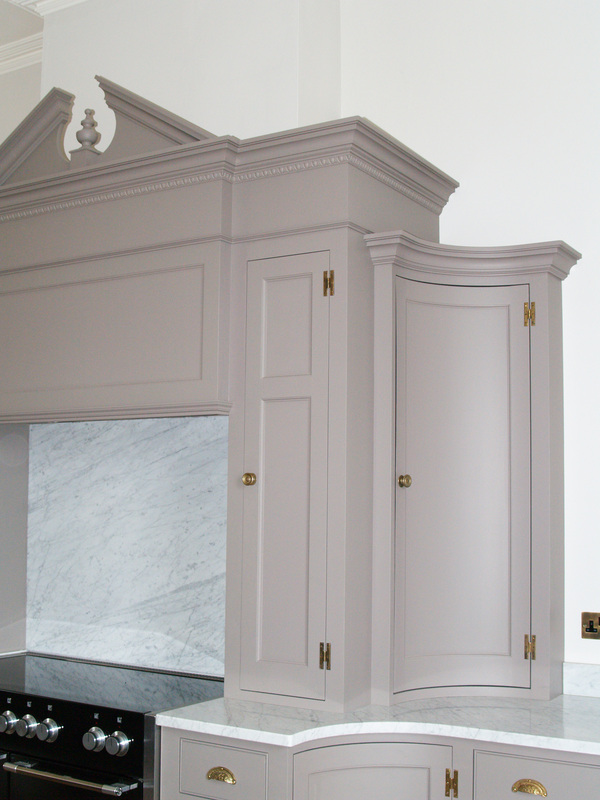 Taken from the basic brief of "chiffonier" this stunning piece utilises the graduated drawers for large pan and tray storage. 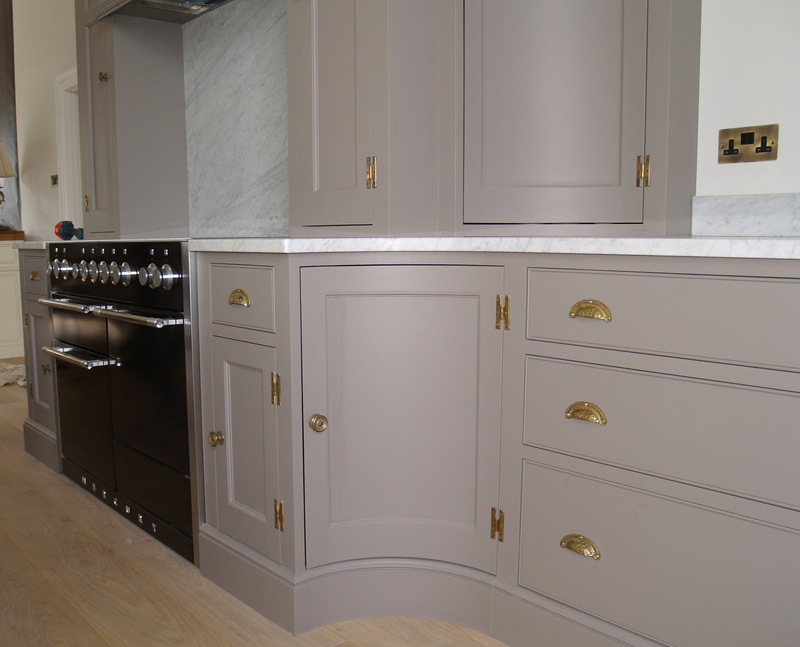 The angled corners and slender arch detail features throughout the kitchen. 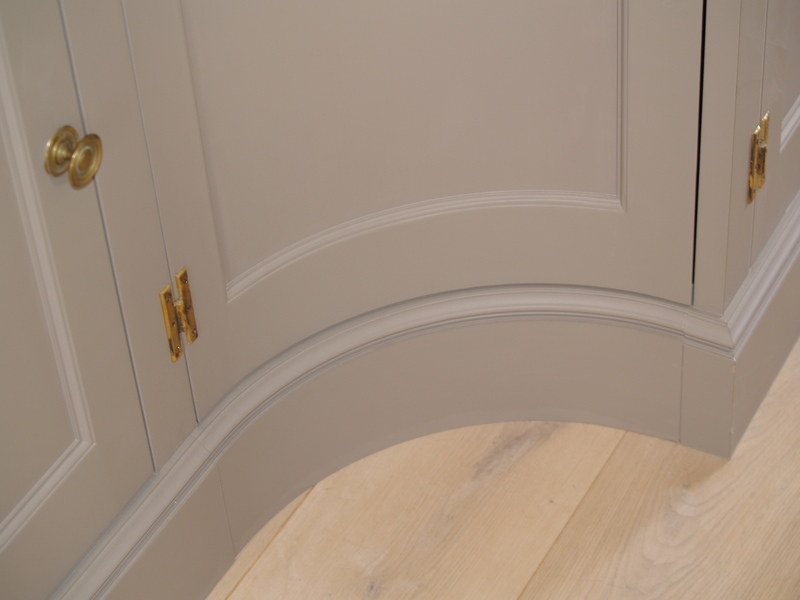 The typical Gothic arch detail in all of the door panels was taken from one of the original doorways in the conversion. 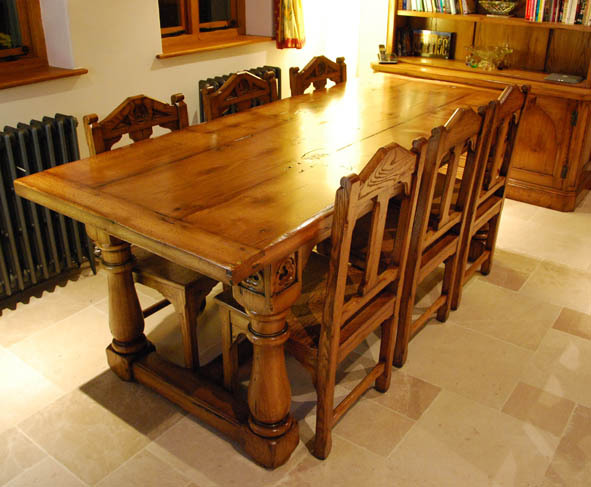 A stunning table and chairs with a hand carved "trefoil" detail completed this themed kitchen. 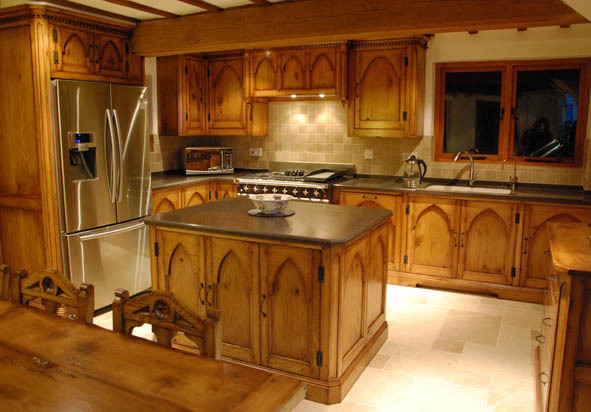 Reflecting the Jacobean period but with a light Oak twist on the traditional dark colours. 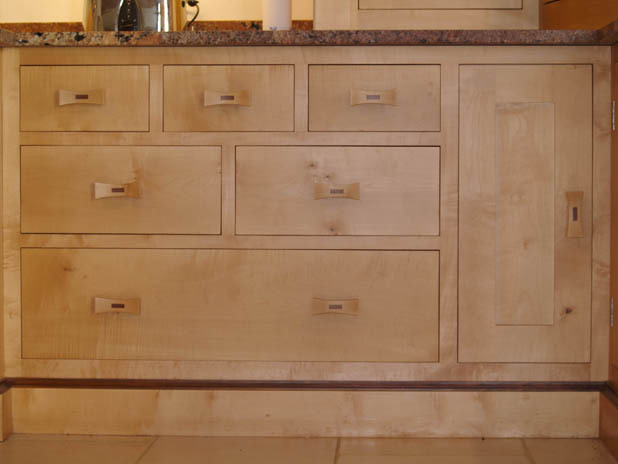 A well proportioned island unit. 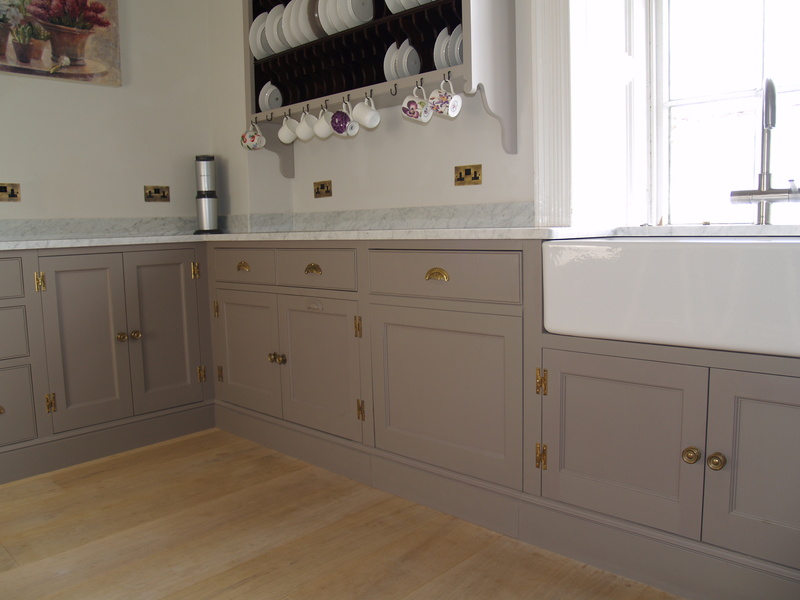 Subtle detailing to a sink unit. 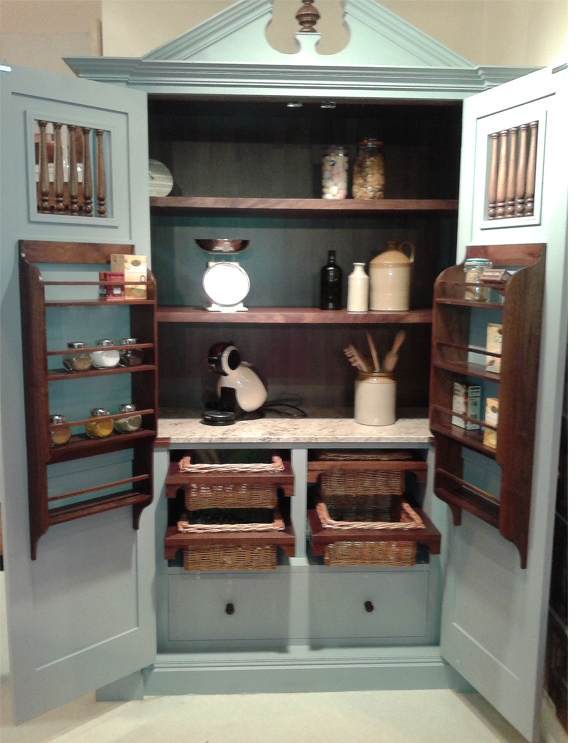 This larder unit offers a wealth of extra storage. 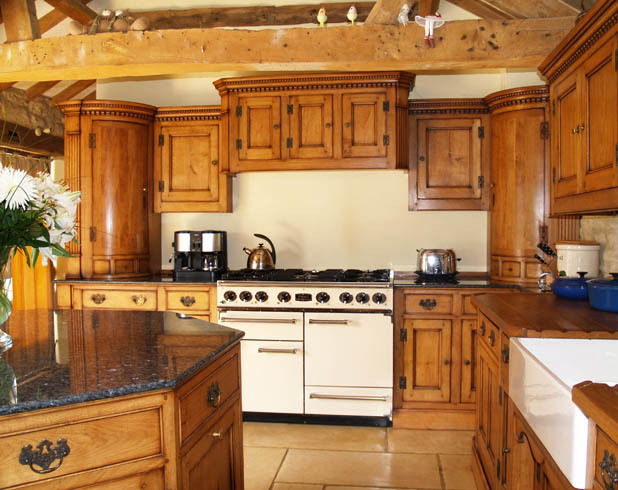 Typical Jacobean detailing with authentic drop handles. 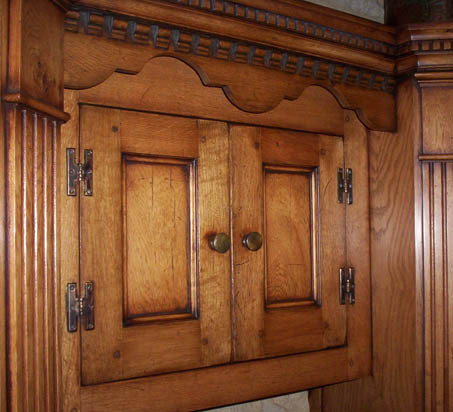 The "Arts and Crafts" style never fails to offer a classic look. 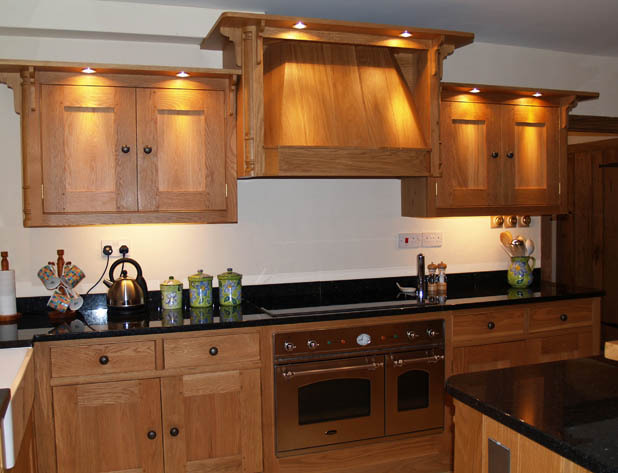 Subtle lighting gives an ambient atmosphere. 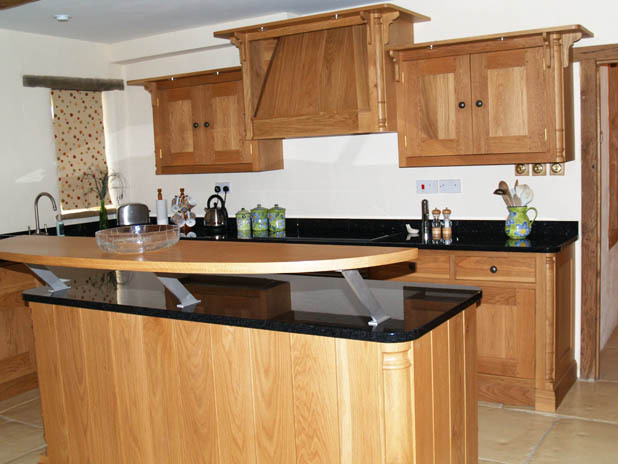 Black granite works superbly with the natural character of the Oak. 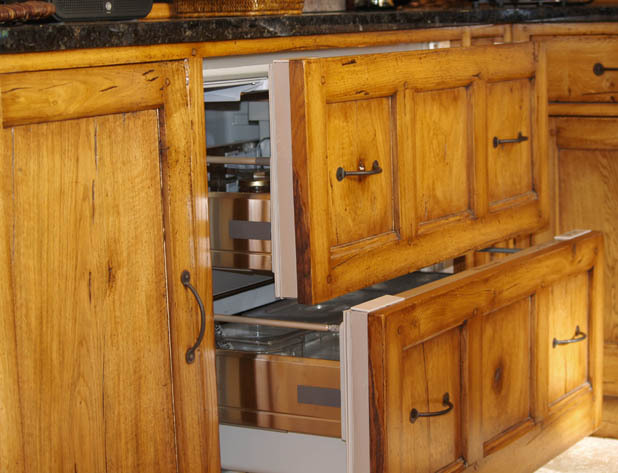 Useful storage to the rear of an island unit. 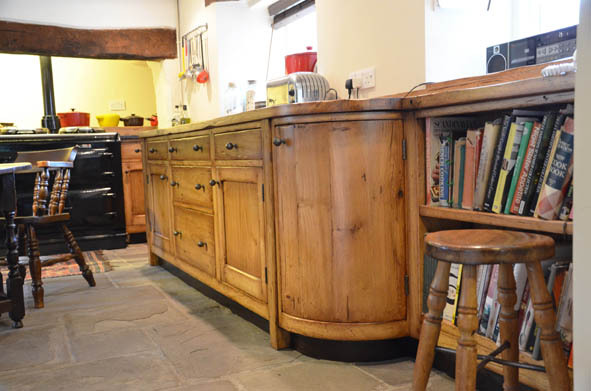 Lots of quirky "character" built in. 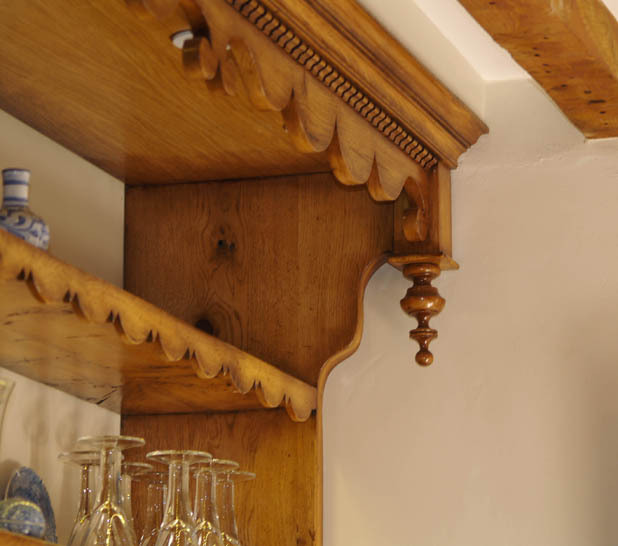 Dentilled cornice, reeded pillasters, shaped frieze. 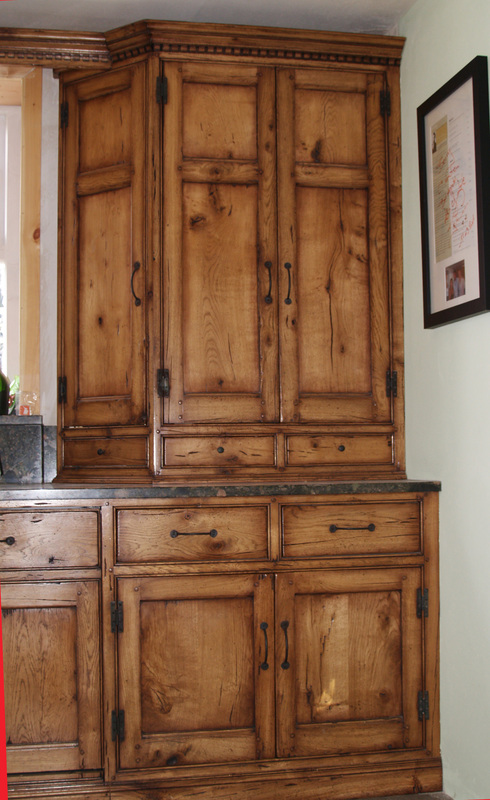 A truly authentic finish. 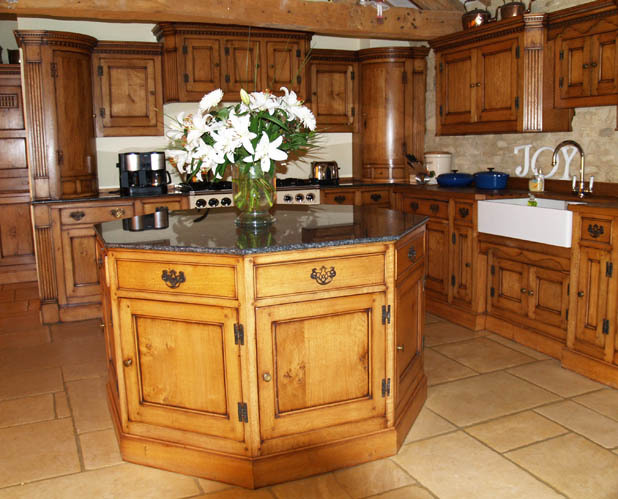 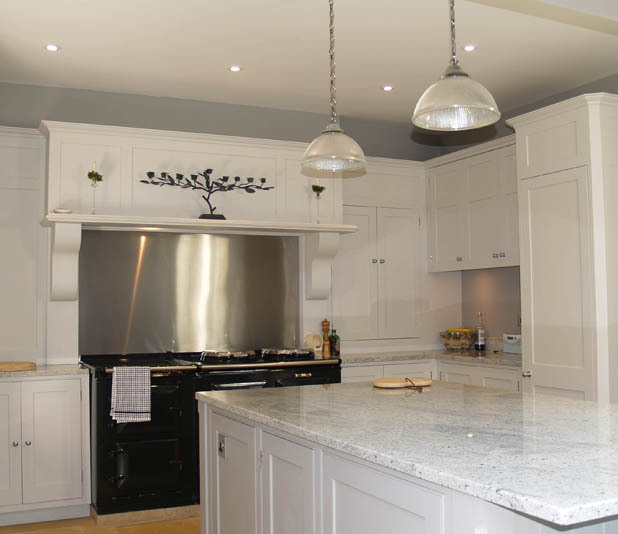 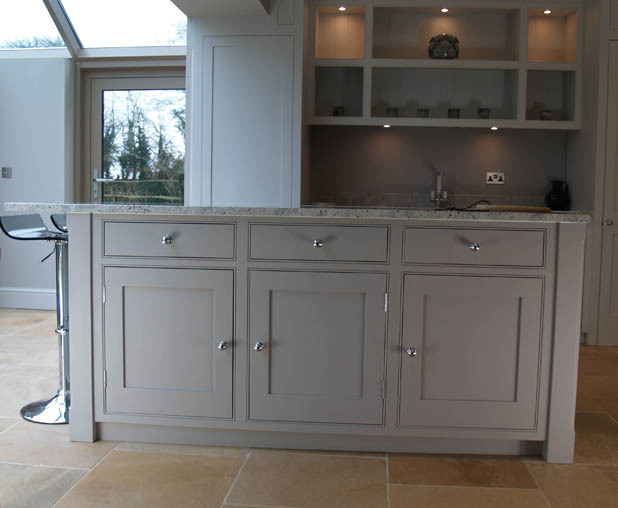 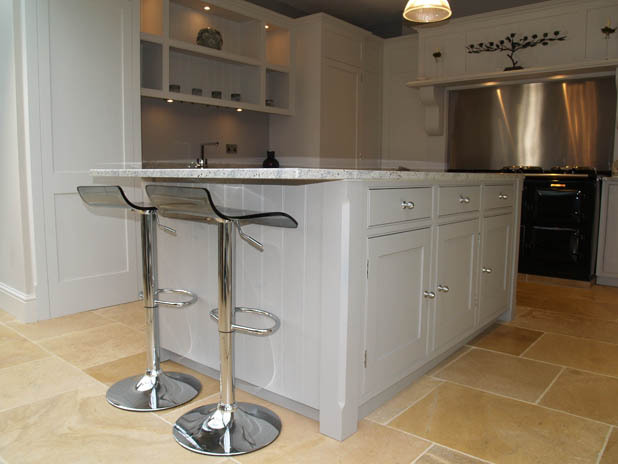 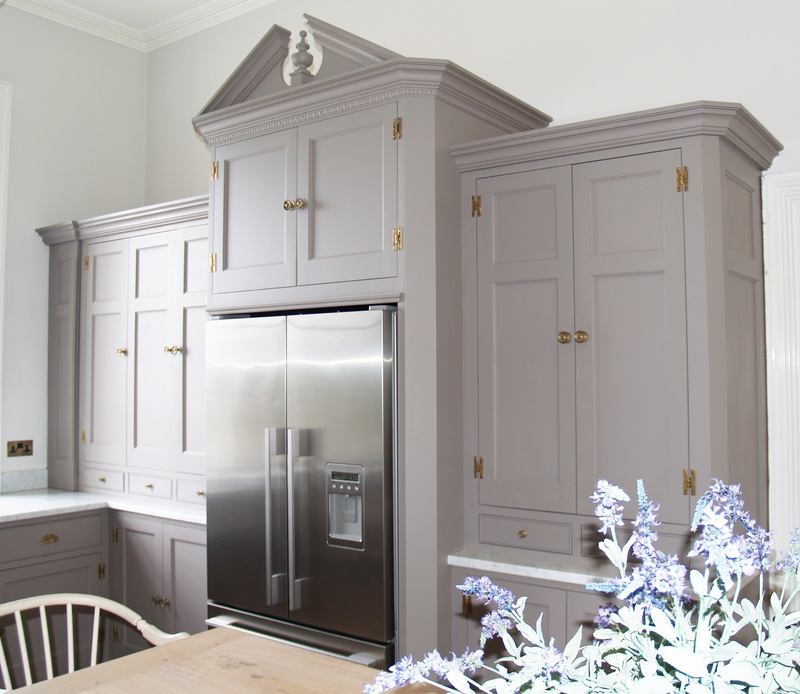 A bespoke octagonal island created a focul point for this stunning kitchen.